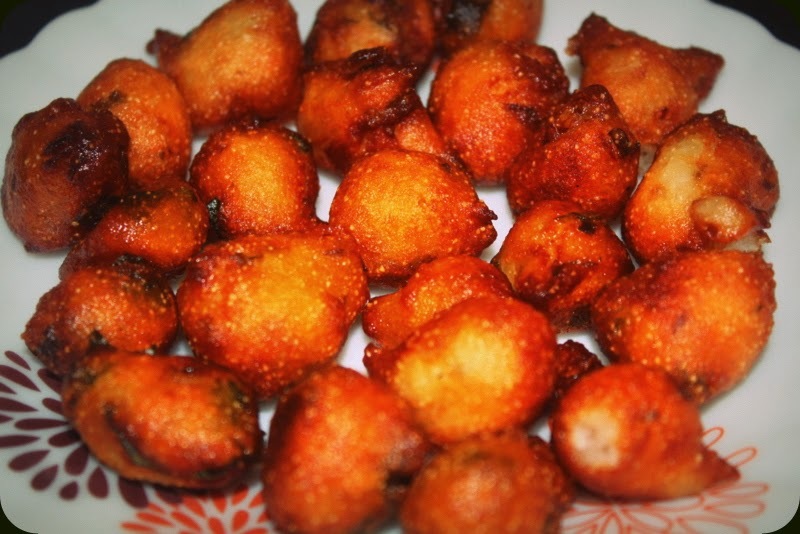 Punugulu are a deep fried fritters made from left over Idli/Dosa batter. Its a very popular street food in Andhra. Great way to use up the left over batter. The key to make tasty punugulu is making them less oily, yet crispy. This can be done by making the batter in the right consistency. Not too thick and not too thin. Thick batter makes your fritters hard, while the thin runny batter, makes them oily and soggy too. Take the dosa batter and add the rice flour, semolina, chopped onion, green chillies,cumin seeds, chopped ginger, salt and chopped coriander,curry leaves. Do not add any water. If the batter is still runny add lil more rice flour to get correct consistency. Mix everything nicely and let it rest for at least 30 minutes. Heat oil in a kadai. Once its hot, drop small balls of batter into it. Reduce heat to medium and turn the fritters once they change colour. Serve as-is or with any chutney. I love pickles and can totally survive on pickles if given a choice. 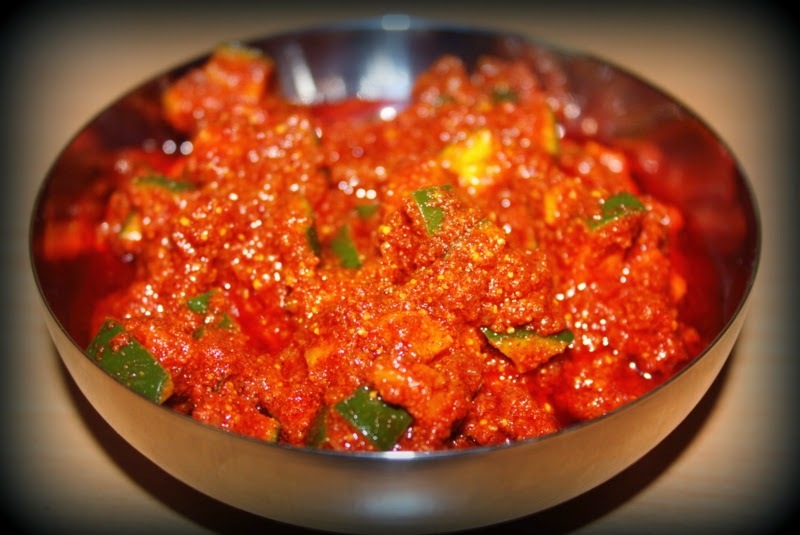 Avakaya/mango pickle is one of my favorite pickle. I was never a fan of summers, only 2 things made me happy- school holidays and my moms mango pickle. My mom makes this amazing raw mango pickle in summers, we used to eat it for the whole year. So, the one my mom makes is toughest pickle as she makes it with almost 200 raw mangoes cut into big pieces. This year I attempted to make an easy pickle on my own and it turned out great. I call this the cheat version because this is the quick and made with very few ingredients. Nothing complicated or high end. Wash and wipe the mangoes with a dry cloth and cut them into very small pieces along with the skin. Spread on a dry cloth to dry for half an hour to one hour. 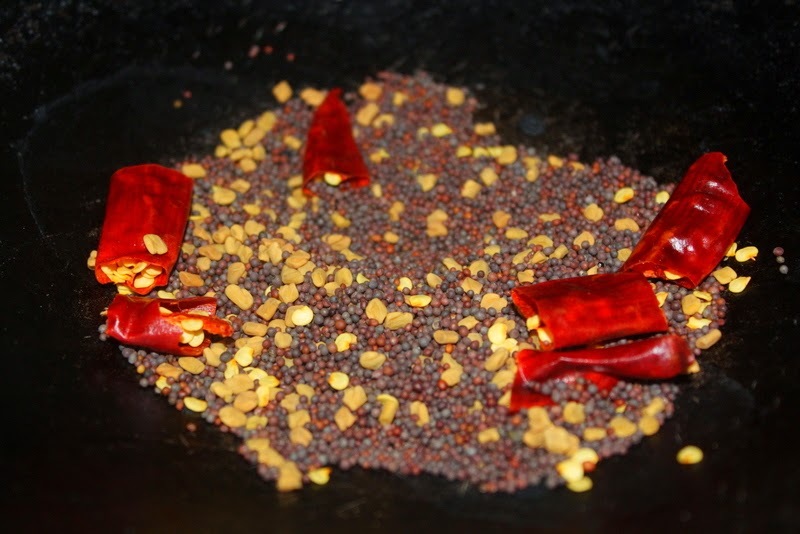 Dry roast methi seeds and mustard seeds and red chillies in a pan and cool them completely and powder them in blender. 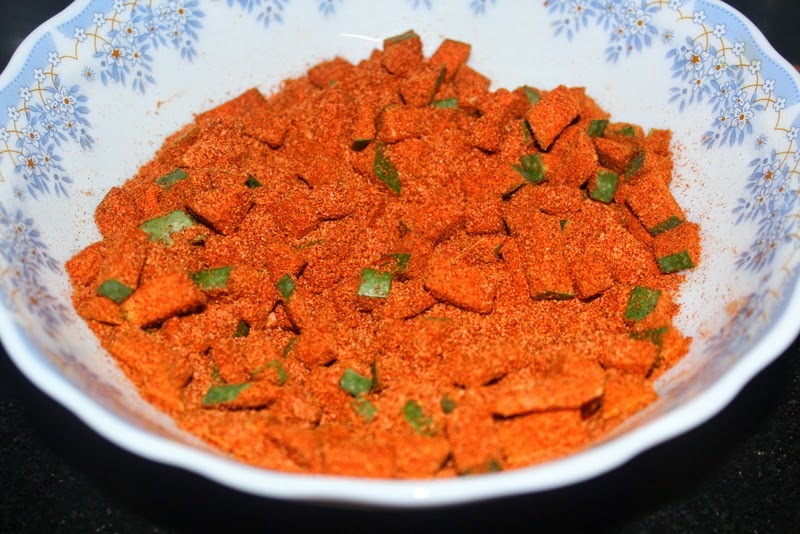 In a bowl mix red chili powder, mustard-methi powder, salt, turmeric, hing until everything is mixed well. 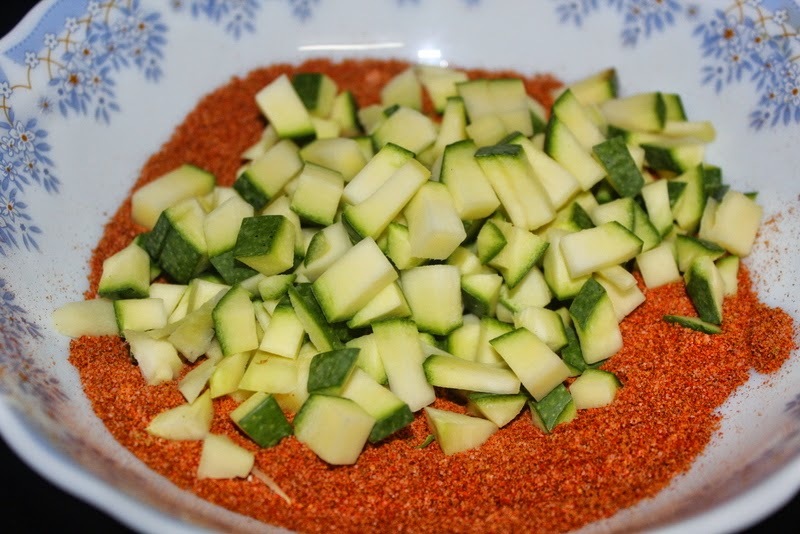 Add mango pieces to it and coat them with the spice mix. Add cooled sesame oil over the pickled mango pieces and mix well. Store the pickle in an air tight container and let it rest for a day. Be very careful to keep your hand dry while making the pickle. Try to use plastic spoon for mixing the powders. Moist can make the pickle not last very long. 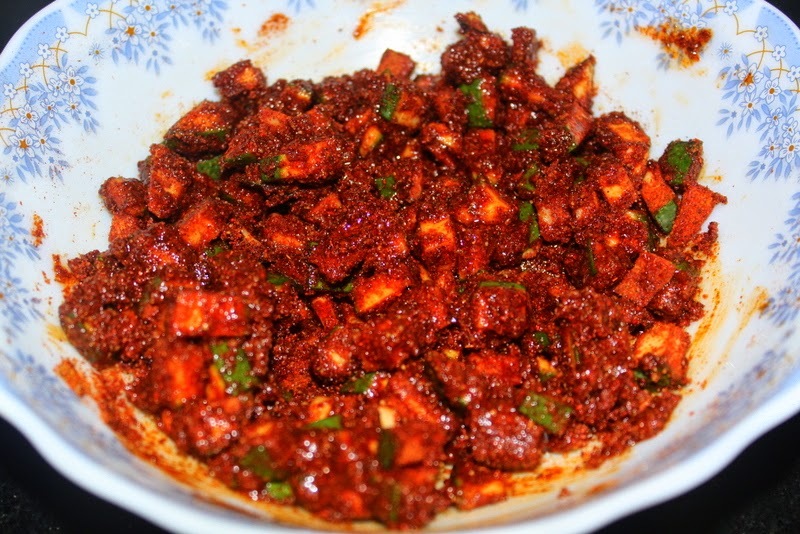 Use the best chilli powder with great colour, its just makes the pickle look divine! After a day, you can see that pickle releases oil. Then you check the taste and adjust salt. You could store the pickle for a month in refrigerator, if used carefully.